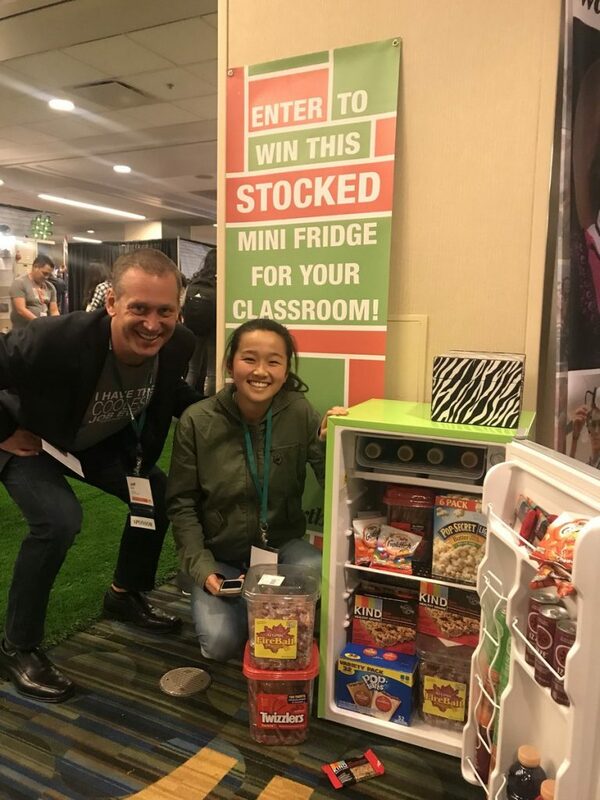 Two yearbook advisers won fully stocked mini fridges for their yearbook staffs during Friday afternoon’s prize drawing in the Walsworth Yearbooks booth at the JEA/NSPA Spring National High School Journalism Convention in San Francisco. Michelle Riley, yearbook adviser from Burlingame High School in Burlingame, California, was drawn as one of the winners. Burlingame student Eugenia Zhang was on hand in the booth for the drawing (she is pictured above with Walsworth’s Jeff Bell, executive vice president of yearbook sales), and she got to spread the news to the rest of the staff. Camryn Baum, yearbook adviser at Ward Melville High School in East Setauket, New York, was drawn as the other mini fridge winner. For any adviser or staff that visited the Walsworth Yearbooks booth on Thursday or Friday last week at the convention and participated in an activity, their yearbook adviser was eligible to enter the drawing. The mini fridges will now be delivered to the two schools, to be used in their yearbook rooms, fully stocked with goodies, including Goldfish crackers, Pop Tarts, popcorn, Twizzlers, Gatorade, LaCroix water and more.